As a young girl whose mom and dad fought a lot, Sarah found comfort in food. “I’d down a bag of chips, feel guilty, then I’d eat even more,” she says. Her parents divorced, but Sarah’s bad eating habits stuck. 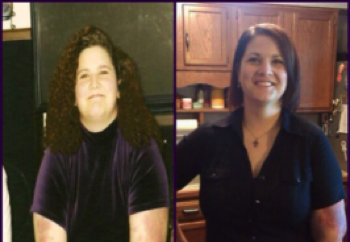 By the time she was 15, she weighed 185 pounds. Instead of taking away “bad” foods, Sarah added good ones. “I went along with my sister to her doctor’s appointments and listened while her physicians told her which foods she should be eating,” she says. 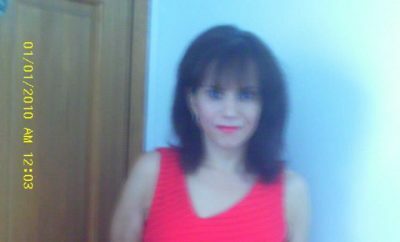 “I learned that fruits and veggies aren’t just low in calories, many are also high in cancer- fighting antioxidants. I made a rule that as long as half my plate was filled with them, the other half could be anything I wanted.” As a result, she started losing about a pound a week. Sarah also knew she had to find a better way to deal with stress than bingeing on cookies and chips. “I was having trouble sleeping because I was so worried about my sister, so I would take long walks in the evening to tire myself out,” she says. 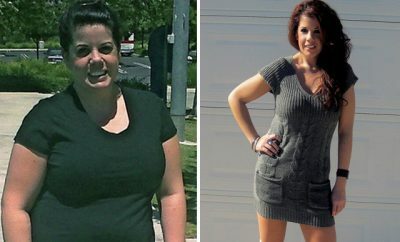 “It helped curb my anxiety more than eating french fries did.” After one year, Sarah was down 50 pounds. “I loved the feeling exercise gave me, which is why I started working out harder,” she says. “I was in college, so I used my school’s gym, added weight training with moves I learned from magazines like Shape, and replaced some of my walks with jogs,” she says. 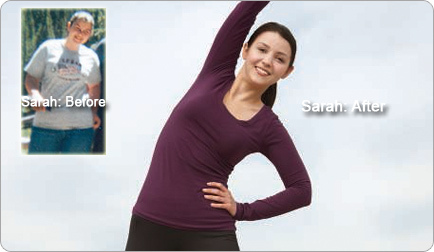 In another six months, Sarah dropped 20 more pounds.